Today we celebrate International Day for Biological Diversity! Biological diversity - or biodiversity - refers to all of the plants, animals, humans, and ecosystems living on Earth. Within each ecosystem exists an intimate web of living creatures interacting with each other and with the environment. Every species, no matter how big or small, plays an important role in an ecosystem. The culmination of these diverse species interactions provides a wealth of biological resources that ultimately form the pillars of human civilization. Biodiversity underpins the very foundation of our lives, determining what we eat, how we dress, and where we build our homes. This special day seeks to protect the unique biodiversity we are so closely intertwined with and rely on. Sadly, biodiversity around the planet is decreasing. Human activity and natural phenomena are degrading the Earth's ecological resources. Even the smallest breakdown within an ecosystem can upset the entire system’s fragile balance. Habitat destruction, pollution, and climate change represent a serious threat to biodiversity and, consequently, human development. The 2016 theme, “Mainstreaming Biodiversity: Sustaining People and their Livelihoods,” is devoted to halting this downward spiral of biodiversity destruction. By protecting the natural resources that have made Earth a habitable place for us, we invest in the resilience and wellbeing of people, their lives, and their wellbeing. Preserving our ecosystems now will ensure they will remain for generations to come. The biodiversity of Morocco boasts more than 24,000 animal species and 7,000 plant species inhabiting the distinct ecosystems of the Mediterranean and Atlantic coastlines, the Sahara Desert to the east, the dense forests of the Rif Mountains to the north, and the Atlas Mountains stretching north to south and east to west. Agriculture plays a huge role in the Moroccan economy, employing nearly 40% of the workforce and representing 13% of the GDP. These agricultural ecosystems, however, are particularly vulnerable to overharvesting and climate change. By 2020, it is projected that Morocco’s water sources will plummet by 15 percent and affect approximately 1 million families. 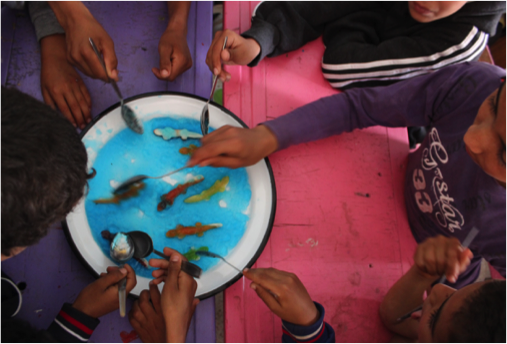 In the last Water School session on “Aquatic Ecosystems,” the children identified the different species living in and around Morocco’s water systems and learned that Morocco has one of the highest levels of fish diversity in the world. To understand how marine life is affected by human factors, they made their own edible aquatic ecosystems from blue jello, cookies, and gummy fish. Every time climate change, pollution, or overfishing were called out, they each ate one fish to represent the loss of a species. To end the last session, Fatiha and six Environmental Youth Ambassadors, a group of six exceptional students selected from DSH’s RISE program, led review games from all of the previous sessions. They played the “solid, liquid, and gas” game and mimicked the behavior of each state of matter. To reinforce what they learned about the different animals around Morocco and where they live, four of the EYAs held up posters of the Sahara, Atlas Mountains, forests in the Rif, and Lexira Beach. When an animal was called, the children raced to the habitat it lives in. 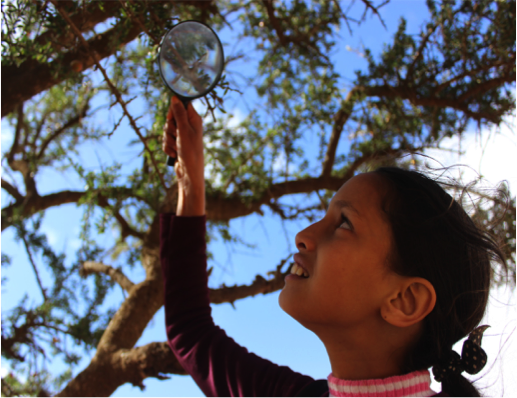 To end the day, the children, armed with magnifying glasses, marched from the dusty school yard to a field dotted with argan trees to practice identifying different plants and observing insects up-close. The EYAs assisting with this session are part of DSH’s new youth empowerment program that seeks to forge environmental partnerships between the rural youth of the Water School and the university students from Agadir. To empower young leaders to promote environmental sustainability in their communities, seven students from DSH’s RISE professional development program were selected to serve as EYAs: Abdelhaq Ait Boulhous, Oumhani Benhima, Salma Edrif, Rkia Elarif, Mohamed Ouabbou, Mohamed Moumin, and Mahdi Lafram. As part of their EYA duties, they helped lead the final two Water School sessions on “Water for Sanitation and Hygiene” and “Aquatic Ecosystems” at the beginning of May. By facilitating some of the educational activities, playing games, and leading the nature walks, the EYAs led by example and served as role models for the children, showing them what they could one day aspire to be. A large component of the EYA experience is visual storytelling and environmental journalism. 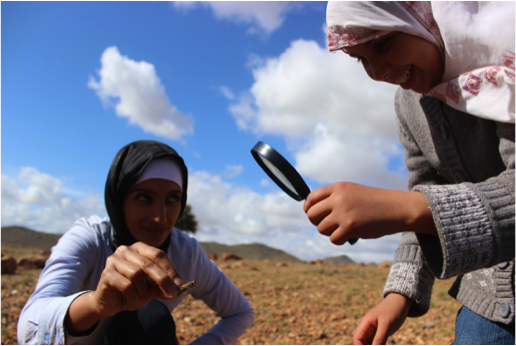 The EYAs have also been documenting their experiences working with the Water School, drawing comparisons between the the flora and fauna of Ait Baamrane and Agadir, and confronting the unique environmental challenges both communities face through photography and videography. To hone their digital media and storytelling skills, the EYAs attended trainings led by Leslie Dodson, one of DSH’s consultants and a journalist with over 20 years of experience who has worked for Reuters, NBC, and CNN. With her guidance, the EYAs will be curating their own photo exhibition and environmental film series in the coming months. Environmental issues in southwest Morocco do not receive significant attention or publicity, but by drawing awareness to these challenges through visual art and media, EYAs will have this opportunity to advocate for their communities on a local and international scale. Their work will be officially showcased at the COP22 conference to be held in Marrakech in November 2016, which will also be a space to spotlight the admirable efforts of Moroccan youth raising awareness about and fighting climate change and threats to biological diversity. Throughout the summer, the EYAs will be organizing events that spur collective action and contribute to sustainable local environmental solutions. To stay updated with EYA activities, check out their blog here. Today’s youth are tomorrow’s leaders. With the Water School, RISE, and EYA programs, Dar Si Hmad seeks to empower Moroccan youth to take charge of protecting the biodiversity and ecology of their communities today for a more sustainable Morocco tomorrow. From the our office and EYAs in Agadir and the children of the Water School, happy Biological Diversity Day!